Guthrie: You know, there's a sense of entitlement about you, Dr. Avila. But you should know it's not gonna fly here. Avila: Save the Yoda speech, alright? Guthrie: Son, I can teach you how to be a better doctor. I'm good at that. But I can't teach you respect. So, if you want the former, you're gonna have to learn the latter. 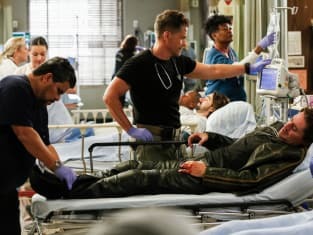 Code Black Season 3 Episode 4: "The Same as Air"
Kimchi -- it's the same as air. You need it to live. In some villages, the punishment for a crime is jail or no kimchi. Everyone wonders which is worse. Angus: My legs are shorter than yours! Will: Then move them faster. Permalink: Then move them faster.